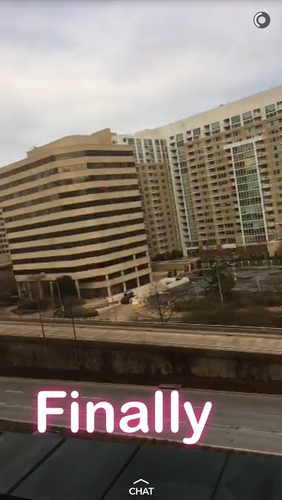 Follow the March for Our Lives in Washington, D.C., through the eyes of a group of Northside Achievement Zone students, there from Minneapolis. The D.C. event began at noon and drew hundreds of thousands of people. Back in St. Paul, thousands gathered for one of more than 800 companion marches planned around the world today. 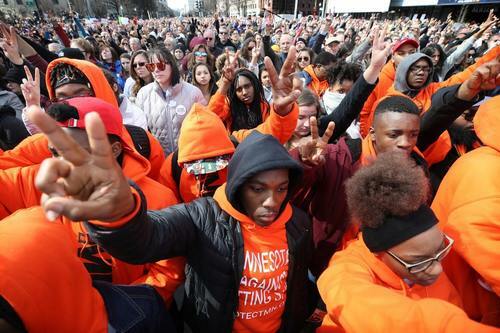 Powerful, alive, with "hope for the better"
The Minneapolis students crowded in with hundreds of thousands of others on Pennsylvania Avenue today, calling for an end to gun violence in a rally with speakers and performers from across the country. “It was very powerful, I actually ended up crying,” Antiquita said. Antiquita said she’s lost family members and friends to gun violence, so the experience “brought back memories, traumatized memories.” Several of today’s speakers have also felt those impacts. The program featured dozens of students from elementary through high school, including survivors of last month’s school shooting in Parkland, Fla. Crowds packing the street prevented the Minneapolis students from reaching the stage where musicians like Miley Cyrus, Jennifer Hudson and Lin-Manuel Miranda were performing. But Antiquita said big-screen projectors brought the words and music up close. 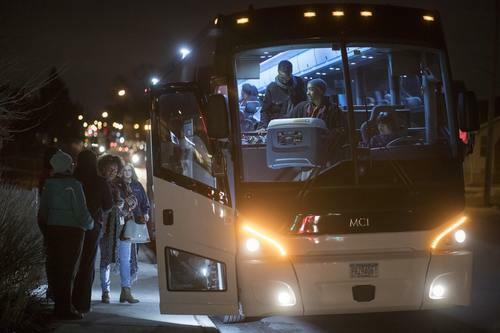 Later, the Minneapolis students boarded a bus for home and settled in for a ride of about 17 hours that will put them back in Minneapolis Sunday afternoon. They were tired from the long day, but they resolved not to let today’s march be the end of the story. “I’m definitely going to keep talking about it, especially to the younger generation, so that they’re aware of what’s going on. I have lost a lot of friends to gun violence, and I don’t want to see anybody else lose their friends,” Andre said. “I’m going to do whatever I can to make a change with gun violence … We’re going to make a change, Minnesota is going to do something about it, and this won’t happen ever again,” Antiquita said. The March for Our Lives, a national student-led demonstration against gun violence, is scheduled for Saturday in Washington, D.C.
Organizers expect 500,000 people to attend, according to the event's permit application. Among them: A group of 20 students from North Minneapolis' Northside Achievement Zone is on the road this week to join the marchers in Washington. The Minneapolis students plan to meet with legislators, tour the city and join the demonstration on Pennsylvania Avenue Saturday. MPR News is following their trip and will post updates from them here over the next four days. The national student-led demonstration comes just over a month after a shooter killed 17 people at a high school in Parkland, Florida. At 7:45 p.m. on Wednesday, Antiquita, Andre, Damon and Keirra were more than ready to get on the road. They all jumped in at once on a phone call. "We've been ready," Andre said. (He'd already posted "Bye Minnesota" on his Facebook page about two hours earlier.) 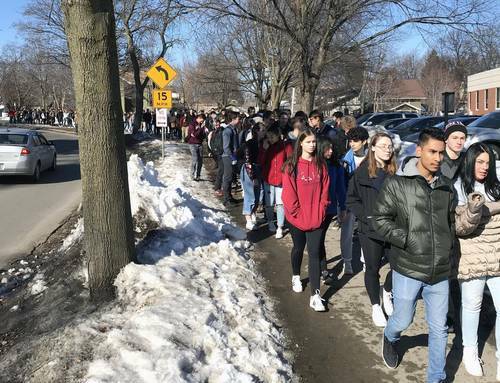 He said the students had been inundated with information in preparation for the trip including "statistics, and facts about guns and the laws and Minnesota state laws, and what they're trying to accomplish." Antiquita added, "We learned about how to voice our opinion in a smart way." The group's avid photographer, Damon Brown, said he's eager to capture Saturday's crowds. "You can see the power," he said. 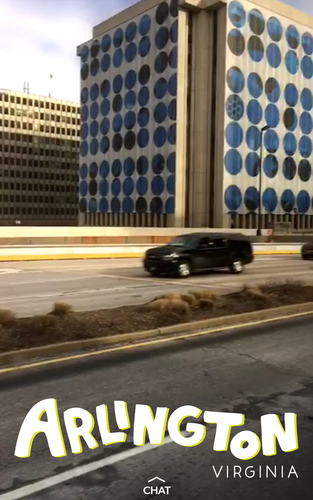 Keirra Phillips posted to Snapchat Thursday morning as the bus drew closer to Washington. 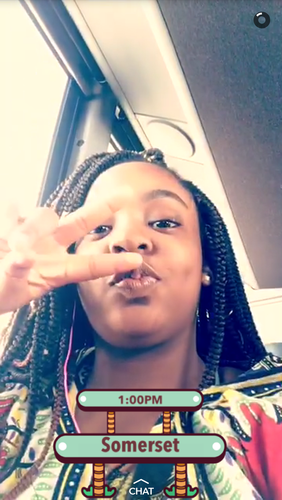 Keirra Phillips posted to Snapchat as the bus passed Somerset, Pa.
Students from Minneapolis drew close to the end of their bus trip to Washington, D.C. Thursday afternoon. The students are headed to Washington to join Saturday's national March For Our Lives. 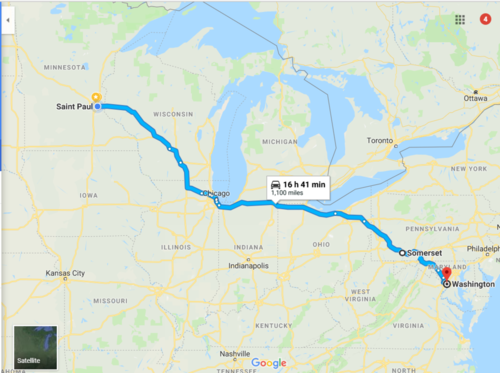 Teenagers are crowding the highway rest stops and restaurants in Washington, D.C., the four Minneapolis students reported Thursday night. “I actually have some friends who, their jobs and their schools have brought them out to D.C. for this,” Andre said. After a long bus trip from Minneapolis, the students arrived in Washington, D.C., in time to get dinner and check out a local laser tag spot. As a first-time visitor to Washington, Andre said he's noticed the landscape. “The view is -- the mountains! -- I’ve never seen real mountains before. It’s not like how it is on TV. [Here] the mountains have a lot of trees. It’s nice, I like it,” Andre said. 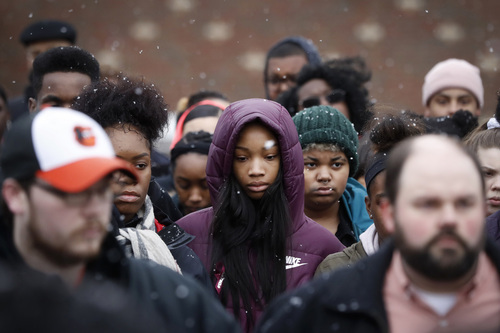 Before Saturday’s March For Our Lives on Pennsylvania Avenue, the students plan to visit Howard University, a handful of monuments and the Smithsonian National Museum of African American History and Culture. 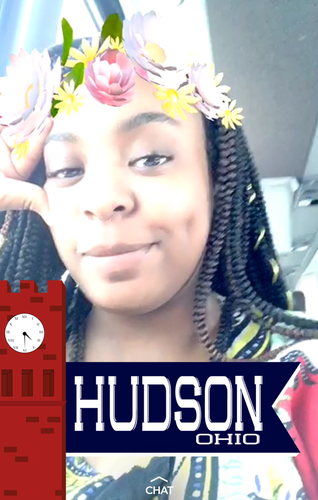 “I’m excited to see Howard University, because I’m in eleventh grade, so I’ll be going to college soon. 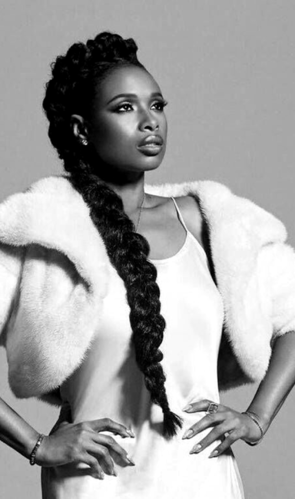 It’ll be interesting to have a college tour to open up some opportunities,” Keirra said. Antiquita said she can’t wait to “go deep” on black history, artifacts and stories she doesn’t get to learn at school when the group visits the museum. “I’m hoping to find out some stuff that my school kind of tries to hide from me so I can ask them, ‘Why don’t we talk about this?’ or ‘Why don’t we talk about this?’ if it’s a part of black history,” she said. Antiquita stepped up to the microphone this morning to speak at a press conference with Minnesota Sen. Amy Klobuchar, Florida Sen. Bill Nelson and former Arizona Sen. Gabrielle Giffords. Another student on the trip, Andre, is part of a group of students and experts from across the country set to discuss student activism on the national radio program On Point this morning. Later today, the Minneapolis students plan to visit Howard University, monuments in the nation's capitol and the Smithsonian National Museum of African American History and Culture. Antiquita met with Minnesota Sen. Amy Klobuchar and Florida Sen. Bill Nelson Friday morning. Listen for Antiquita's comments starting at 10:00. Keirra Phillips documented the visit and posted these updates to Snapchat. 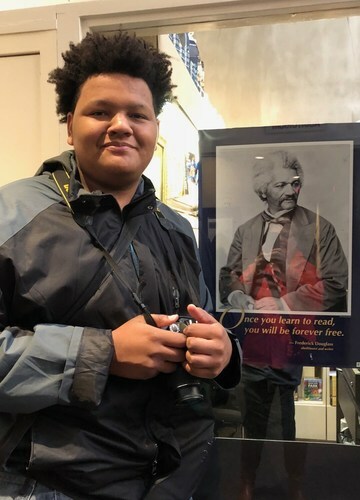 Damon Brown posed with a portrait of Frederick Douglass during the group's Friday morning visit to the Frederick Douglass National Historic Site. It shouldn't take someone's life to be lost, or multiple lives to be lost, for things to change. On the eve of gun violence protests in Washington and around the country, we sit down with student activists. The students checked off some must-see Washington, D.C., destinations Friday including the U.S. Capitol, the White House, the Lincoln Memorial and the Smithsonian National Museum of African American History and Culture. Star TribuneMore than 100 students from several Minnesota schools will be in Washington to join a national protest calling for gun control. Snapchat posts by Keirra Phillips. "People need to start standing up for what they believe in." The Minneapolis students settled in for an evening of sign-painting – and made an impromptu trip to McDonald’s – Friday night after a long day of touring. The group visited the U.S. Capitol building, the Lincoln Memorial and other must-see destinations. They also paid a visit to the Smithsonian National Museum of African American History and Culture. For Keirra, the Museum of African American History and Culture shed light on a subject she felt she’d learned too little about in school, the story of 14-year-old Emmett Till, who was lynched in Mississippi in 1955. Lessons from the museum resonated as Keirra thought about the march just ahead. Keirra said too often, she sees people around her failing to take action and keep the legacy alive of ancestors who endured so much suffering. “They think that every day is guaranteed, which it’s not. People need to start standing up for what they believe in. I think people are too scared to be the odd one out, but somebody has to be the purple elephant in the room someday,” she said. The students painted signs to bring to the March For Our Lives that read “Kill the guns not the people” and “Put the guns down! Let’s prepare for our next generation”. Tomorrow’s rally is expected to draw crowds of hundreds of thousands of young people and supporters. The March For Our Lives gets going at noon Eastern Time today, and the Minneapolis students can’t wait to join the crowds. Hundreds of thousands of people are expected for the event. “I think it’s going to be very purposeful, and I’m expecting the energy to be high energy, good vibes. I feed off of good energy and good vibes, so that’s what I’m expecting. Because we’re all here for a purpose,” Damon said. The students made signs Friday night to bring to the march. One of them read “Put the guns down! Let’s prepare for our next generation!” Another, “Kill the guns not the people”. Today’s rally in Washington is set to feature an all-star lineup of musical guests, including Lin-Manuel Miranda, Ben Platt, Miley Cyrus and Jennifer Hudson. Tens of thousands of people, outraged by a recent school shooting and energized by the student survivors, planned to protest in Washington and around the world on Saturday, demanding an end to gun violence. 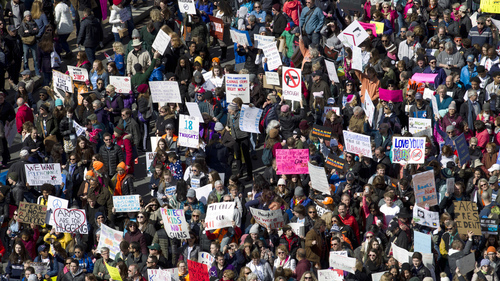 Early scenes from the March for Our Lives in D.C. 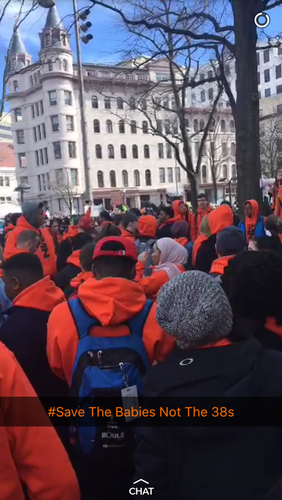 There's lots of orange in sight as the crowd in Washington, D.C., prepares for today's March For Our Lives. Keirra sent this Snapchat post at 11 a.m. Eastern Time. Marchers gathered early this morning at Harriet Island and started toward the state Capitol. Thirteen other marches are planned across the state, including in Duluth, Rochester and Willmar. Student-led marches are planned for more than 800 cities around the world. Thousands of Minnesotans are headed now for the Capitol. 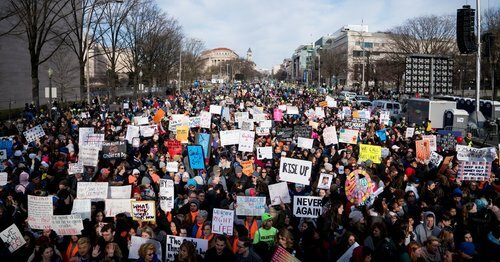 March For Our LivesSaturday, March 24 in DC, we March For Our Lives. Students from across the nation will raise their voices defiantly and say: “NEVER AGAIN” We are excited musical guests will join students on stage in support of our efforts to end gun violence in America, including: Jennifer Hudson Common Lin-Manuel Miranda Miley Cyrus Vic Mensa … Continue reading "PERFORMERS"
NPR.orgMassive crowds descended upon Washington, D.C., and across the nation Saturday to march for gun control in the U.S., galvanized by the deadly shooting at a high school in Parkland, Fla., last month. Star TribuneLocal students joined others from across the country for the March for our lives on Saturday in Washington, D.C.